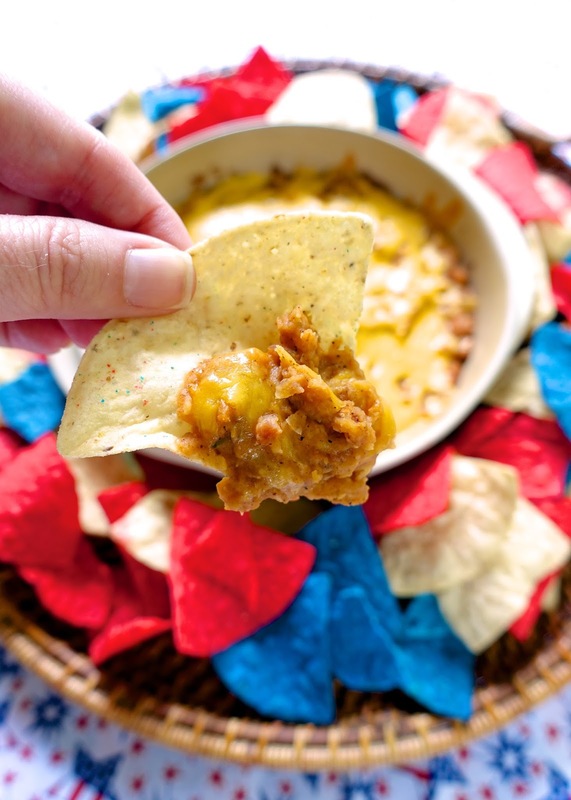 Need a last minute appetizer for your 4th of July party? 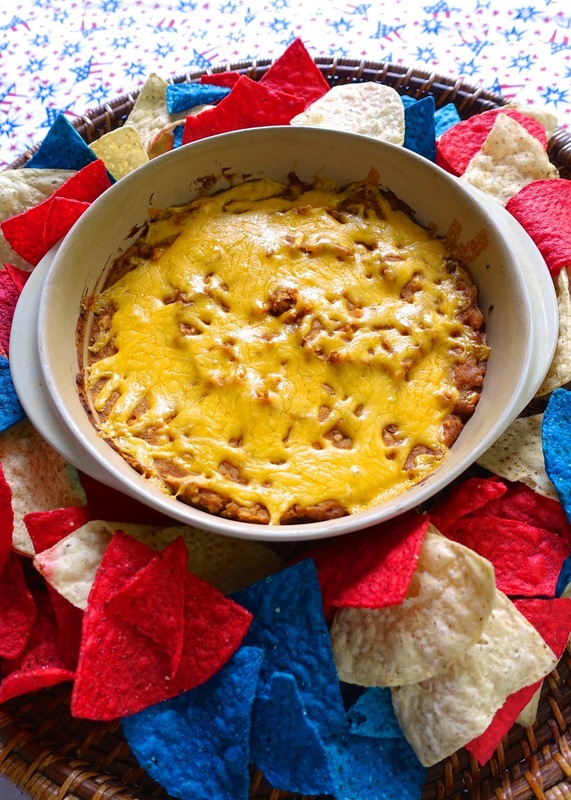 Look no further than this BBQ Bean Dip. It only takes about 5 minutes to prepare and it tastes delicious. Most of the flavor in this simple dip comes from the BBQ sauce. I used my Homemade BBQ Sauce and it tasted so good in this dip! I couldn't stop eating it. Sweet and smoky deliciousness. If you aren't using my Homemade BBQ Sauce in this dip, make sure to use a BBQ sauce that you really like. It will be the star of the dip. This dip can be made a day ahead of time and heated up when you are ready to serve it. I served the dip with some red, white and blue chips. I got them at World Market. They were so festive! This dip would also be really, really good with Fritos. In a food processor, combine bacon, onion flakes, beans, BBQ sauce and garlic powder. Process until smooth. Stir in 1/4 cup cheese. Spread into a 1-qt baking dish. Bake for 20 minutes. Sprinkle with remaining cheese. Bake an additional 5 minutes. Serve with tortilla and/or corn chips. Happy 4th...I think I will be making this today. I actually have all the ingredients on hand...including your homemade bbq sauce (which btw is my new go to recipe). Where in the world did you find such vibrant red and blue chips? Delicious looking dip! And I want to know where to get the red chips too lol!! Such cute chips, too bad we don't have a World Market around here.